What is the meaning of Jerusalem to Islam? 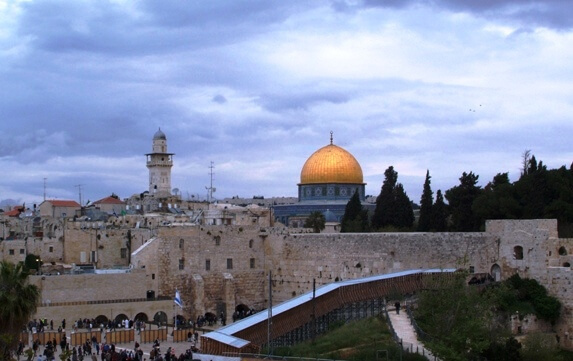 The Arabic name for Jerusalem is 'Al Quds' which means 'the Holy One'. Jerusalem is a holy city for Jews, Christians and Muslims because of its association with Abraham, David, Solomon, John the Baptist and Jesus, all prophets recognized by Islam. 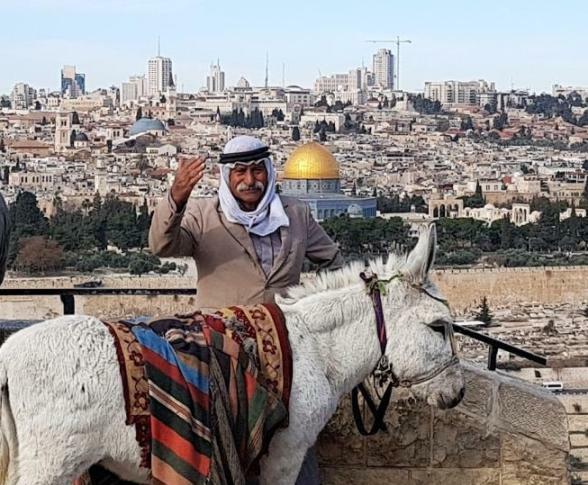 But it is Jerusalem's connection to the life of the Prophet Mumammad which makes it the third holiest city to Islam, after Mecca and Medina. According to the Koran, one night in the year 621, Muhammad was woken from sleep by the angel Gabriel and taken on a miraculous Night Journey. The Night Journey consisted of the Isra and the Miraj. In the Isra, the Prophet travelled on his horse Buraq from Mecca to Jerusalem where he led other prophets in prayer. In the Miraj, Muhammad ascended to heaven from the Sacred Rock of Jerusalem and spoke to God. 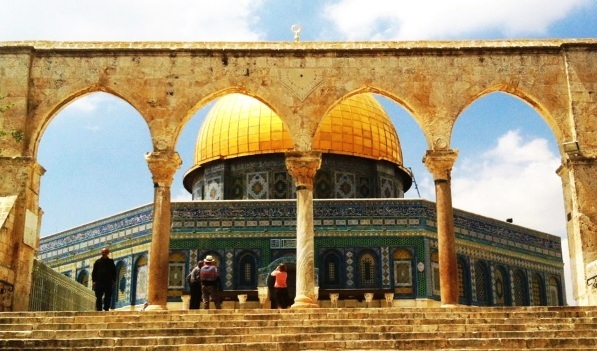 Jerusalem is home to noteworthy sacred and historical Muslim sites. If you wish to explore Jerusalem Islam - the holy and historical Muslim sites of Jerusalem, book our Private Tour of AlQuds with a Muslim Guide. Muslims call the Temple Mount area in Jerusalem - Al Haram Ash Sharif, which means the Noble Sanctuary. The entire area was destroyed by the Romans in the year 70. Over the centuries, the area became a garbage dump. The great Caliph Umar bin al-Khattab was a personal companion of Mohammed. He visited Jerusalem in the year 637, a few years after Muhammad's death. He cleaned up the rubbish and built a small mosque, preparing the way for the monuments to be built. Al Aqsa Mosque with the small silver-gray cap is also known as al Masjid al Aqsa, as mentioned in the Koran alluding to the Night Journey and where Mohammed prayed with the prophets. 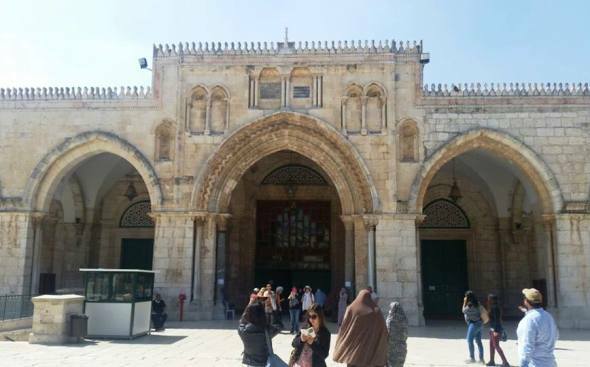 It is considered the 3rd holiest site to Muslims in the world. 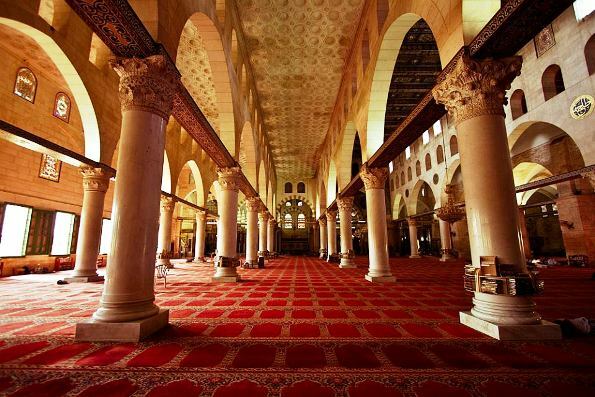 The second significant building in Al Haram Ash Sharif is the Dome of the Rock, called Qubbat al-Sakhrah by Muslims. The Dome of the Rock is the oldest Islamic monument in the world, built around 691. The beautiful Dome is plated in real gold. This is not the original gold cover which was replated several times. It houses the Sacred Rock from which Muhammad ascended to Heaven on the Night Journey. 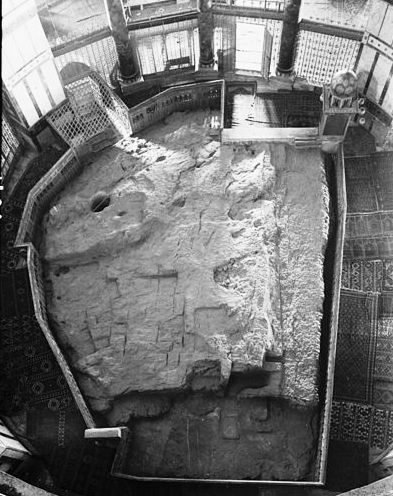 The rock is also believed to be the rock where Abraham nearly sacrificed Isaac. Jews and Christians call the rock the Foundation Stone from which God created the world. and the Underground Mosque, the largest mosque in the country holding up to 10,000 worshippers. Please note that Muslims and non-Muslims alike can enter the Al Haram Ash Sharif area, but only Muslims can enter the mosques and the Dome of the Rock shrine. The Muslim Quarter of the Old City of Jerusalem is full of Islamic sites and places to visit including ancient mosques, bath houses and hospices. 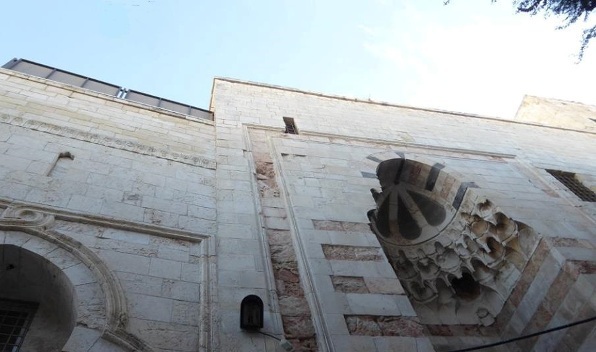 The Ancient Mosque of Omar is where the Caliph Omar Ibn al-Khattab prayed when he entered the city. There are lovely buildings and architecture in the Muslim Quarter from the Mameluk period in the late Middle Ages. One of the most beautiful is the Lady Tunshuk's Palace with its 3 beautiful doorways. Lady Tonsuk was a wife of one of the Mameluk leaders. She is buried in a mausoleum just across the street that you can visit. Today an orphanage is located in the Palace. Another impressive Mamulek building is the Madrasa al Tashtamuriyya, originally a Muslim house of learning. The large, sprawling Souk (open-air market) is in the center of the Muslim Quarter and parts of the Christian quarters. The high ceilings and arches date at least from the Ottaman period, and parts of the Souk date from much earlier, as far back as the Roman times. There are actually many parts to the Souk, not just the main tourist areas. There is a meat market, textile market, and spice market. There are excellent eateries in the suq as well and its a great place to stop for a local meal, or at leat a coffee spiced with cardomom. Perhaps the most beautiful shuk not far fromis Suq al-Qattanin, the market of the cotton merchants. 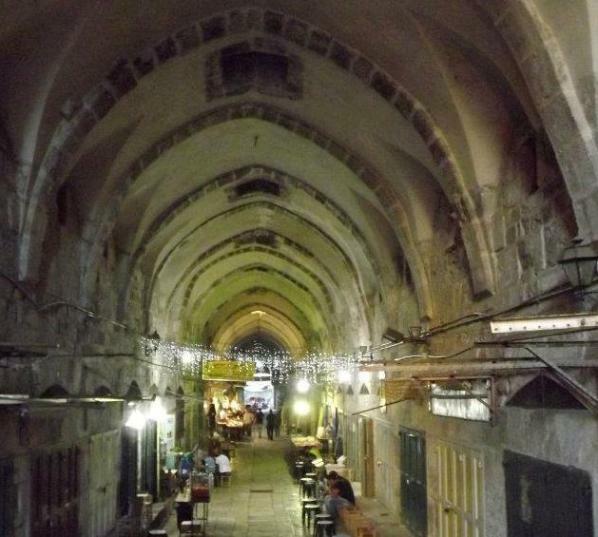 Sometimes called the Suq of ‎Amir Tankaz al-Nasiri, this ancient market is a covered bazaar with pillars and and a beautiful, arched tile roof. 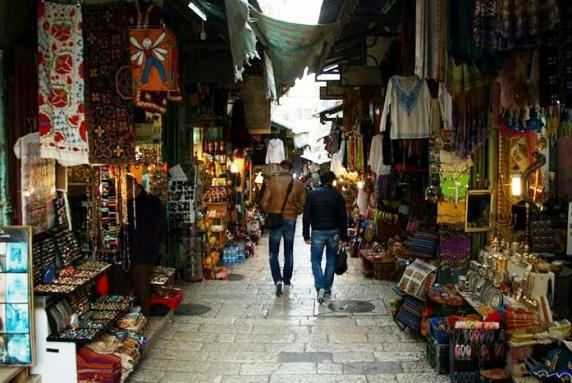 All the souks in the Old City are a good place to buy souvenirs. Just don't forget to haggle.